Amy Ewing, P.G., is a Hydrogeologist and licensed Professional Geoscientist, specializing in water resources investigations and planning, managed aquifer recharge (MAR), water quality studies, watershed management, intergovernmental water operating agreements, and permitting. Ms. Ewing has more than 15 years of experience in all aspects of water planning, including working with municipalities and water systems on water supply and demand analysis, water audits, conservation, drought management planning, and regional and state water planning. 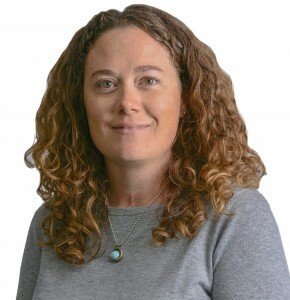 She is Project Manager for the Albuquerque Bernalillo County Water Utility Authority’s recharge projects, which aim to establish a long-term drought reserve using surface water for recharge. She is also supporting the City of Hobbs on its MAR demonstration project planning. Ms. Ewing routinely supports clients with applicable regulatory requirements, necessary permitting, and the identification of funding sources. Other projects have involved regionalization, reuse, source water protection planning, watershed management, and water quality investigations. Ms. Ewing has been instrumental in DBS&A securing more than $20 million in federal and state funding for our clients’ projects. Ms. Ewing has worked with a range of clients, including the Albuquerque Bernalillo County Water Utility Authority; the Cities of Albuquerque, Bloomfield, Carlsbad, Clovis, Farmington, Gallup, Hobbs, Las Cruces, Portales, Las Vegas, Rio Rancho, Raton, Ruidoso, Santa Fe, and Tucumcari, New Mexico; New Mexico Interstate Stream Commission; New Mexico Office of the State Engineer; New Mexico Environment Department; the Counties of Colfax, Los Alamos, McKinley, Quay, and Santa Fe, New Mexico; the Towns of Silver City and Clayton, New Mexico; Laguna Pueblo, Jemez Pueblo, Hopi Tribe, the Pueblo of Acoma, and San Ildefonso Pueblo; Glorieta area mutual domestics; Northwest New Mexico and Eastern Plains Councils of Government; Eldorado Water & Sanitation District; Waste Management; High Plains Underground Water Conservation District; Texas Water Development Board; and U.S. Army Corps of Engineers. Ewing, A. 2018. Integrating Surface Water and Groundwater through Managed Aquifer Recharge. Presented at Sixteenth Biennial Symposium on Managed Aquifer Recharge. San Diego, California, March 7, 2018. Ewing, A. 2018. Integrating Surface Water and Groundwater through Managed Aquifer Recharge. Presented at Association of Ground Water Agencies – American Ground Water Trust Annual Conference. Ontario, California, February 12, 2018. Ewing, A., Hill, J., Wolf, C. 2018. Water Well and Recharge Workshop. Albuquerque, New Mexico, January 18, 2018. Ewing, A. Recharge and Alternative Water Supply Projects: A Regulatory and Historic Perspective. Presented at the New Mexico Infrastructure Finance Conference. Santa Fe, New Mexico, October 26, 2017. Ewing, A., Hill, J., and Wolf, C. 2017. Collaboration and the MS4 Watershed Based Permit. Presented at the 33rd Annual Tri-State Seminar. Las Vegas, Nevada, September 28, 2017. Ewing, A. 2017. Aquifer Recharge In New Mexico. Presentation at the Groundwater Management Districts Association Summer Conference. May 26, 2017. Ewing, A. 2017. Recharge in the Southwest. Presented at Rocky Mountain Section of American Water Works Association and Rocky Mountain Water Environment Association 3rd Annual New Mexico Water Workshop. Albuquerque, New Mexico, April 7, 2017. Ewing, A. 2016. Managed Aquifer Recharge in New Mexico. Presentation at the 2016 New Mexico Infrastructure Finance Conference, Ruidoso, New Mexico. October 27, 2016. Ewing, A. 2016. Northeast New Mexico Regional Water Plan and Aquifer Storage and Recovery in New Mexico. Presentation at the Eastern New Mexico Water Conservation Summit, Clovis, New Mexico. June 29, 2016. Ewing, A. 2016. Albuquerque Bernalillo County Water Utility Authority Aquifer Storage and Recovery. Presentation at the National Groundwater Association Conference on Hydrology and Water Quality in the Southwest. Albuquerque, New Mexico. February 24, 2016. Ewing, A. 2016. Albuquerque Bernalillo County Water Utility Authority Recharge Project Overview. Presentation at the 2016 National Ground Water Association Conference on Hydrology and Water Quality in the Southwest. Albuquerque, New Mexico. February 24, 2016. Wolf, C., B. Marley and A. Ewing. 2016. Applying geochemistry to managed aquifer recharge projects. Presentation at the 2016 National Ground Water Association Conference on Hydrology and Water Quality in the Southwest. Albuquerque, New Mexico. February 24, 2016. Wolf, C.P., R.Marley, and A.Ewing. 2015. Applying Geochemistry to Predict Water Quality at Managed Aquifer Recharge Sites. Presentation at New Mexico Water Conference, Taos, New Mexico. October 9, 2015. Ewing, A., J.M. Stomp III, and K Yuhas. 2015. ABCWUA Aquifer Storage and Recovery (ASR). Presented at 2015 National Ground Water Association Groundwater Summit. San Antonio, Texas, March 16-18, 2015. Ewing, A. 2014. Managed Aquifer Recharge in the Southwest – Historical Developments in CA, AZ, NM & TX. Law Seminars International: New Mexico Water Law. Santa Fe, New Mexico, September 11, 2014. Marley, R., Blandford, N., Ewing, A., Webb, L., Yuhas, K., 2014. Managed Aquifer Recharge as a Solution to Water Scarcity and Drought, European Geosciences Union General Assembly, Vienna, Austria. April 27 – May 2, 2014. Ewing, A., K. Yuhas, J.M. Stomp III, and M. Bitner. 2014. Albuquerque Bernalillo County Water Utility Authority Aquifer Storage and Recovery. Presented at the National Ground Water Association Conference on Hydrology and Water Scarcity in the Rio Grande Basin. February 26, 2014. Albuquerque, New Mexico. Johannesen, C., Liu, B., Ewing, A., Wolf, C. 2014. Lower Rio Grande Salinity Monitoring. Invited presentation. 2014 Multi-State Salinity Coalition Summit “Sustainable Solutions in an Era of Climate Variability.” Las Vegas, Nevada. February 20-21, 2014. Ewing, A., K. Yuhas, J.M. Stomp III, and A. Friedt. 2013. Albuquerque Bernalillo County Water Utility Authority (ABCWUA) Webster Well 1 Aquifer Storage and Recovery. Presented at the American Water Resources Association (AWRA) 2013 Annual Water Resources Conference. November 6, 2014. Portland, Oregon. Ewing, A. 2010. Watershed restoration in Sugarite Canyon. Presented at the New Mexico Watershed Forum, Albuquerque, New Mexico, September 28, 2010. Ewing, A. 2010. New Mexico commercial water audit program. Presented at the American Water Works Association (AWWA) Sustainable Water Management Conference & Exposition, April 11-13, 2010, Albuquerque, New Mexico. Klise, G.T., A.M. Neir, M.E. Campana, A. Ewing, B.B. Vener, and A. Rieu-Clarke. 2009. Hydrovulnerability of west Asia. Chapter 3 in United Nations Environment Programme and the Universities Partnership for Transboundary Waters (comp. ), Hydropolitical Vulnerability and Resilience along International Waters: Asia. Hilton, J. and A. Ewing. 2009. NEPA clearances and stewardship, Sugarite Canyon, New Mexico. Presented at Collaborative Forest Restoration Program Annual Workshop, January 27, 2009. Hilton, J. and A. Ewing. 2005. Challenges of meeting water demands during drought. Presented at New Mexico Interstate Stream Commission Drought Summit, October 6, 2005. Kay, J., J. Kelsey, A. Ewing, E. Pease. 2005. Estimating moisture flux in the vadose zone. 2005 New Mexico Technical Water Research Symposium, Socorro, New Mexico. August, 2005. Sloan, L.C., M. Huber, R. Peters, and A. Ewing. 2000. Modeling the Paleogene, Part 1: Paleogene terrestrial climate change predicted from climate modeling studies. GFF (Geological Society of Sweden), v. 122, p. 80-81. Sloan, L.C., M. Huber, and A. Ewing. 1999. Polar stratospheric cloud forcing in a greenhouse world: A climate modeling sensitivity study. p. 273-293 In F. Abrantes and A. Mix (eds. ), Reconstructing ocean history: A window into the future. Kluwer Academic/Plenum Publishers.